There are so many reasons why a person might purchase a new cross or medal of their favorite Saint. 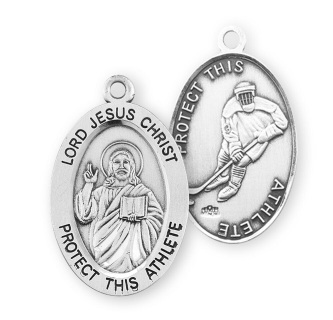 For most people of the Christian faith, including Catholic, these items are not only a piece of jewelry, but a representation and reminder of your faith, especially in your hour of need. 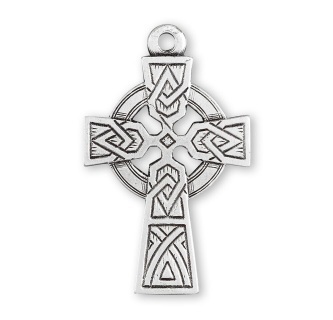 All of our medals or crosses are made from the finect .925 sterling silver, and are all made here in the USA. They make wonderful religion milestone gifts such as first communion, or simply to help a friend feel safer during travels, or bring great comfort to the sick. Our main partner, HMH, is a family owned business located right here in Massachusetts. 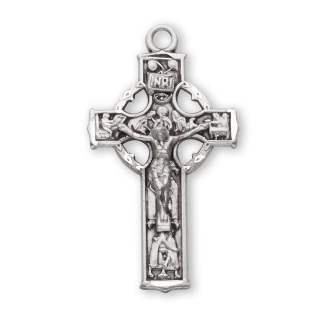 HMH Religious raised the bar many years ago when the company designed, die-struck or cast, and hand finished all their crosses and medals; and they still do today. AdamVintage is honored to be welcomed into the HMH family of superior products made in the USA. 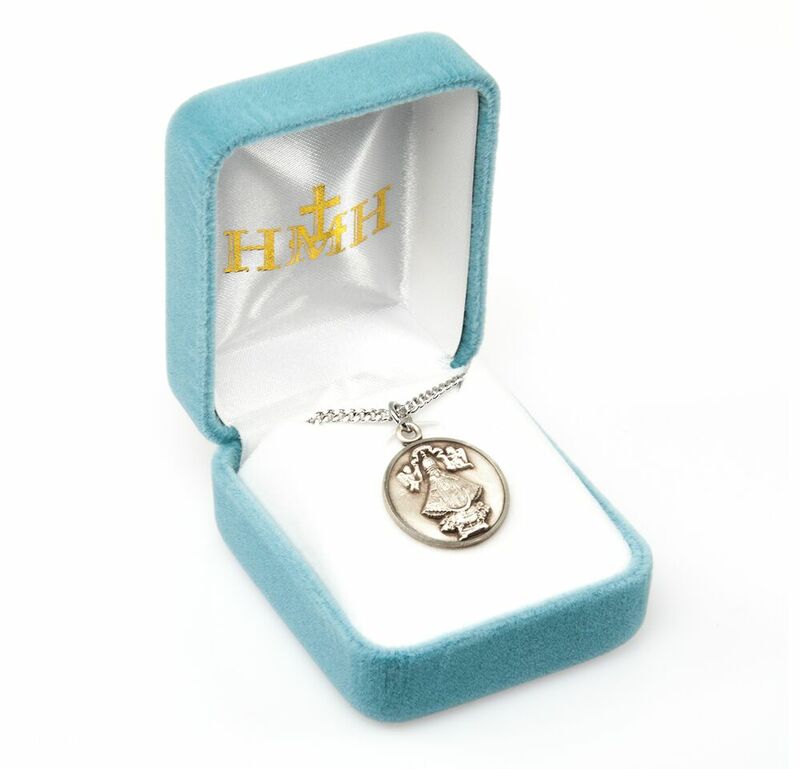 Every medal or cross comes on a rhodium plated chain and HMH baby blue gift box. Weight of medal: 4.5 Grams. Saint Christopher air force medal-pendant. 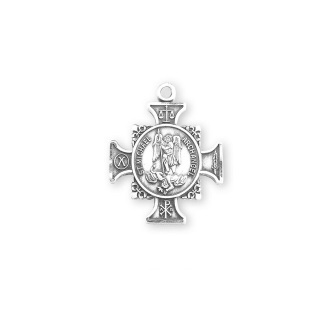 Saint Michael coast guard medal-pendant. Four-way combination Medal, Miraculous-Scapular-Saint Christopher-Saint Joseph medals. Weight of medal: 2.2 Grams. This is a great cross for active or retired military. We also have Military branch specific medals. 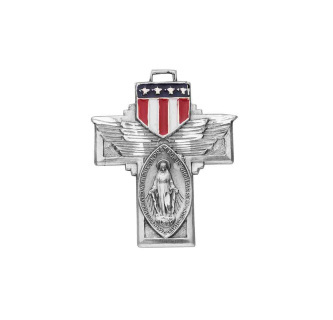 Military red, white, and blue enameled Miraculous cross pendant. Weight of medal: 4.1 Grams. Detail depicts him on the front of the medal. Reverse side of the medal depicts a male wrestler. 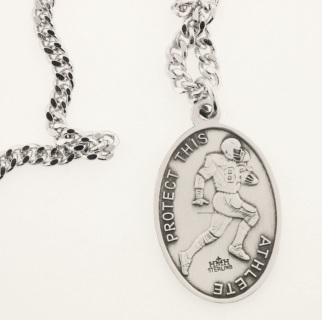 Reverse side of the medal depicts a male football player. From the most trusted religious and spiritual jewelry, HMH Religious. HMH is a family business that manufactures religious jewelry in our own New England factory. 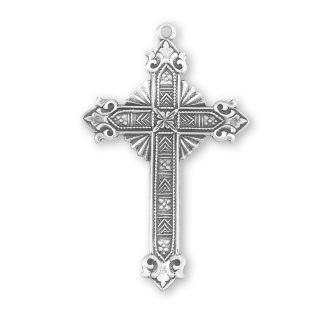 From HMH: We produce the finest quality religious jewelry, medals and rosaries at honest fair pricing. HMH was the first Catholic Jewelry manufacturer in the United States, established in Pawtucket, R.I., circa 1910. Our highly skilled silversmiths produce exquisitely detailed creations in solid sterling silver and gold. All of our pieces are handled carefully, one at a time, with many of them going thru ten or more operations in the manufacturing process. This starts from our exclusive collection of steel dies, some of which date back to roughly 100 years old. The intricate dies from which our fabulous medals are made are “struck/coined” by extreme pressure that enables the finest details to show in the gold and silver stock.Our HMH “family” will always strive to relate to our customers with honesty and integrity. Special attention is given to details and customer service. The members of our service team who will help you are experienced and knowledgeable. They are fully prepared to answer all of your questions and to fulfill all of your needs to make every transaction go smoothly. We are continuously adding newly discovered pieces throughout the year. 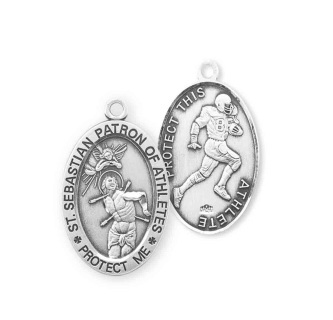 Football medal with Saint Sebastian on the opposite side of the oval pendant. Fleur De Lis tipped cross. Weight of medal: 1.4 Grams. Weight of medal: 3.0 Grams. Detail depicts the Holy Spirit and the seven gifts of the Holy Spirit . The Holy Spirit is the third person of the Holy Family. Weight of medal: 1.7 Grams. Detail depicts him with the infant Jesus. Saint Anthony is the Patron Saint of the elderly, the poor, lost articles, and amputees. A lot of hard work and great . artistry must have gone into making the die used to strike this medal. Its small at 13mm, but is has some of the best detail work of all our medals. I don't believe much of labels, so although this is made in a Roman Catholic style, anyone may where it. Weight of medal: 1.0 Grams. 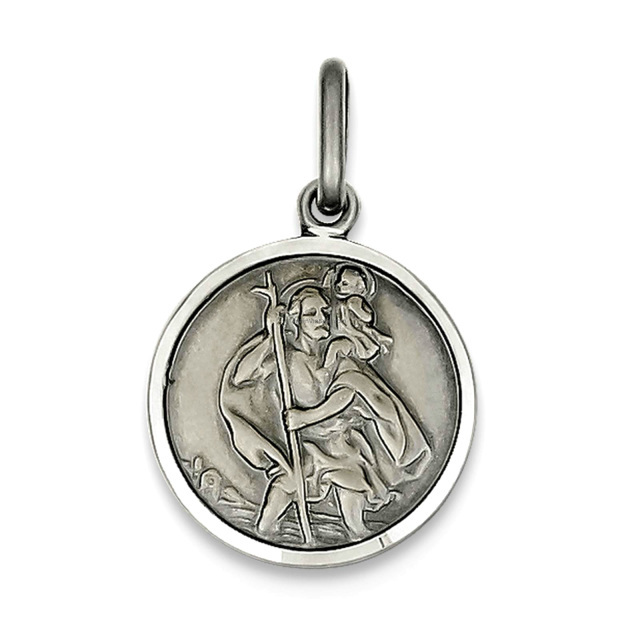 Wearing a Religious Medal of Saint Christopher is said to bring protection while traveling. 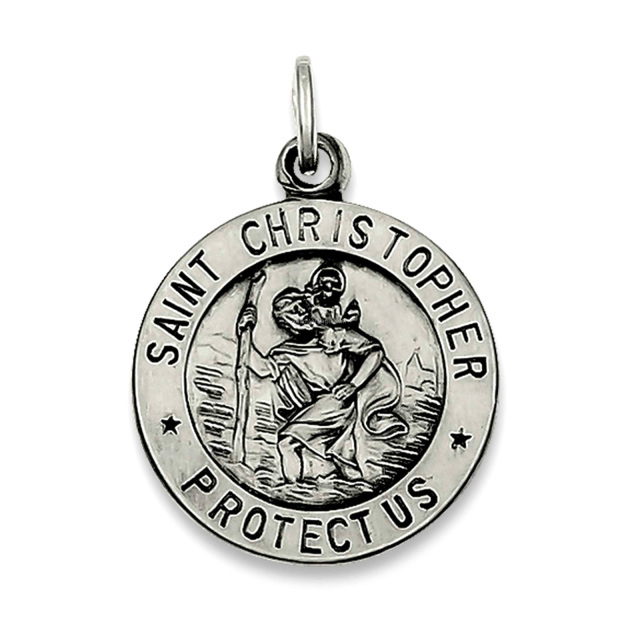 Christopher happens to be the patron of travelers in the Coptic tradition, which further supports an association with Saint Christopher who is the patron of travelers in the Greek and Latin traditions. Makes a great gift for any Christian. Purchase together with one of our necklaces, also in .925 Sterling Silver and save big. What a wonderful gift for anyone who wishes to where an artistic piece of religious jewelry; especially for those who are sick or in their final days. 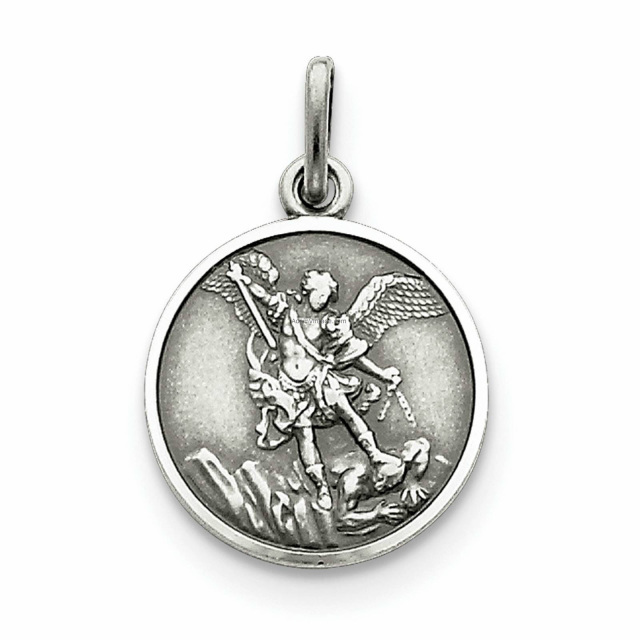 Saint Michael is perhaps the most well known and important angel. Saint Michael the Archangel isn't really a saint, but rather he is an angel, and the leader of all angels and of the army of God. This is what the title "Archangel" means, that he is above all the others in rank.St. Michael has four main responsibilities or offices, as we know from scripture and Christian tradition. Purchase together with one of our necklaces, also in .925 Sterling Silver and save big. 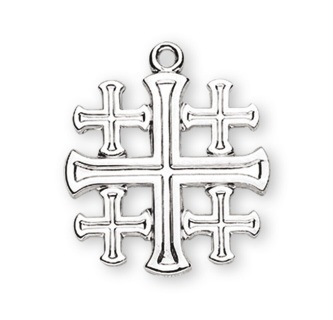 Simple and humble traditional Christian Cross, to wear, to remember your faith. Bold lines and thicker presence than our other simple cross. Purchase together with one of our necklaces, also in .925 Sterling Silver and save big. As fancy as we get, a really nice wood textured cross, to wear, to remember your faith. Purchase together with one of our necklaces, also in .925 Sterling Silver and save big. 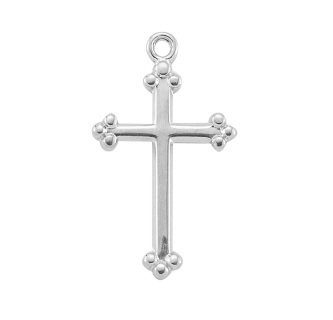 Great simple cross, to wear, to remember your faith. Purchase together with one of our necklaces, also in .925 Sterling Silver and save big. 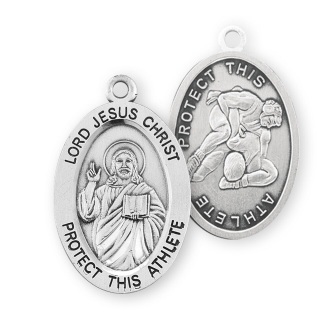 Perfect for the young adult, as a religious or spiritual milestone gift, such as the Catholic Confirmation, Baptist's Baptisms, or the Blessed Sacrament. I'm sure there are many more.